Members would be aware that CNSW is renewing its Strategic Plan this year and we have engaged a sports consultant to help us. Part of the process is to ask members to undertake an e-Survey and the compiled data will assist in working out the future direction of CNSW. We would like as many CNSW members to complete the survey as possible as the more responses we get then the more valid will be the data. If you are happy to undertake the survey please use this link - CLICK HERE to complete the Croquet NSW 2019-2021 Strategic Plan - Member e-Survey. Members may receive an email about this survey from their club or CNSW Officers but will only be able to complete the survey once !! After sign in, club secretaries and CNSW officers can access a CNSW Coaches and Referees section (formerly part of the Yearbook). These lists included email addresses but now also include phone and mobile numbers. An additional Privacy for qualification lists flag is now available to suppress a member's contact details (email, phone, mobile) in such lists. Any member who wishes to do so should sign in and use Edit my details to set this flag, or ask their club secretary to do so. The Board wishes to announce the team that will participate in the 2019 Eire Cup being held in Western Australia from 20th to the 24th March 2019. A flyer from Brenda regarding CNSW showcasing croquet on Australia Day at the annual NSW Government House Open Day has been distributed to club secretaries, CNSW Officers and Regional Coordinators. The program for the day can be accessed here. The 2019 CNSW Yearbook/Member Directory has been emailed to Club Secretaries, CNSW Officers and Regional Coordinators as a Portable Document Format file (PDF). The PDF is fully searchable. In the New Year, CNSW plans to make it available in the Members Area which can be accessed after signing in. Our Schedule of Fees and Reimbursables (available from the Members Area following sign in) has been updated to resolve an anomaly regarding the reimbursement of lawn fees. Clubs pages have been reorganised into CNSW Regions. This week, CNSW emailed three information documents to Club Secretaries. They were (a) an incident report dealing with trip hazards in and around the clubhouse, (b) updating handicaps and indexes in the database and maintaining a single Golf Croquet Handicap Card, and (c) publication of the 2019 Yearbook and future Yearbooks. Your club should post these documents on the club notice board so that all members can read them. 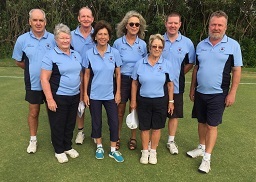 The new rules for Golf Croquet together with some explanatory material is available on the Refereeing page The new rules are due to come into force on 1st January 2019. The online Yearbook, available to club secretaries, has been divided into two sections, Club and Member Directory and Coaches and Referees. The latter is now also available after Member sign in. The Board is pleased to announce that Mr Peter Martin has agreed to become our Club Development Officer. Peter has much experience in forming and developing croquet clubs and is currently the Secretary of Coutts Crossing Croquet Club. If you know of any clubs who might wish to join CNSW, or of people thinking about forming a club, could you point them in Peter's direction.